are valued enough today to save for tomorrow. This attractive Inter-War Art Deco building was constructed in 1940 as the headquarters for the St John Ambulance Association. It also accommodated the affiliated services of the Fire Brigade and ambulance transport service and was used for first aid training courses. The building was designed by the architectural firm Ochiltree and Hargrave, Jack Learmonth Ochiltree being the honorary architect for the St John Ambulance Association. The first St John Ambulance Association in Australia was established in Victoria in 1833, then from the 1880s, St John Ambulance Association centres were gradually being established in all other capital cities across Australia with Perth finally being a big enough city to warrant having its own Association in 1892. In about 1910, the Association expanded by taking over the Fire Brigade’s ambulance service, and in 1921 secured its first headquarters in Murray Street. By 1937, the Association had outgrown Murray Street, and a block of land was purchased on Wellington Street. The new building was officially opened on 10 June 1940, after which it was made available for public viewing to showcase the new facilities and promote its services to the community. In 1979, the new Belmont Administration Building was opened and the Association relocated all its administrative functions from Perth to Belmont. However, the building here in Wellington Street continued to be used for some business and other activities of the Association including a shop, library and museum, although these too would be relocated to Belmont. In 2002/2003 planning was underway to repurpose and adapt the building into a youth hostel. A four storey extension was made to the rear of the building to provide additional accommodation and in March 2006, the new Perth City YHA was opened. Despite the changes and additions made to the site since it was constructed, the original main building has remained much the same. 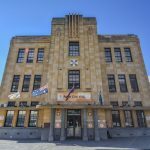 Today, the St John’s Ambulance Building is an important and rare example of a large, specialised building and as a definitive example of the Inter-War Art Deco style that is highly regarded by the Art Deco Society of Western Australia. This attractive Inter-War Art Deco building was constructed in 1940 as the headquarters for the St John Ambulance Association. It also accommodated the affiliated services of the Fire Brigade and ambulance transport service and was used for first aid training courses. The building was designed by the architectural firm Ochiltree and Hargrave, who were prominent in Western Australia in the Inter-War period. Jack Learmonth Ochiltree was also the honorary architect for the St John Ambulance Association. The St John Ambulance Association was originally established during 1877 in England by the monastic Order of St John, said to have its origins from Hospitallers the Knights of St John formed during the First Crusade in Jerusalem in the 11th Century. The main purpose of the Association was to provide public training in first aid, its establishment coinciding with the increasing professionalism of nursing and the beginnings of such organisations as the Red Cross as well as other charitable groups. It was also founded as a response to the impact of wars and the advent of the industrial age with workers being injured in mines, railways and factories, and where there could be delays in getting patients to hospitals or to professional medic which meant life and death situations. The first St John Ambulance Association in Australia was established in Victoria in 1833 which immediately set about the teaching of first aid, examination of students and the awarding of first aid certificates. From the 1880s, St John Ambulance Association centres were gradually being established in all other capital cities across Australia with Perth finally being a big enough city to warrant having its own Association which was authorised in 1892. The foundation of the St John Ambulance Association in Western Australia is credited to Mathieson Harry Jacoby. Soon after his arrival from Adelaide in 1891, where he had earned his certificate in first aid, Jacoby set about establishing a St John Ambulance Association centre in Perth. Jacoby quickly garnered the support of a number of prominent people, especially those who would greatly benefit from first aid training such as leading medical practitioners, members of the police force and the Western Australian Government Railways, and the local military forces. The first meeting of the WA branch of the Association was held on 15 March 1892 with Jacoby as its first secretary. In 1903, a fire brigade ambulance service in Perth was established by Dr George McWilliams. In about 1910, the Association expanded its functions by taking over this ambulance service. The first building to house the central ambulance station and headquarters was located in Murray Street, conveniently adjacent to the central fire station building. By 1937, the work of the Association and its transport service had outgrown the Murray Street facilities, and so the Western Australian Council purchased a block of land on Wellington Street for the purpose of constructing a new headquarters. A building fund appeal was launched, raising a total of £10,000. On 4 August 1939, tenders were advertised for the construction of the new St John Ambulance Building. The successful building contractor was C. W. Arnott at a cost of £16,500. The balance of the cost for the building was to be provided through a loan from the Commonwealth Bank of Australia, and Perth City Council agreed to waive the balance owing on the purchase of the Wellington Street site. The foundation stone for the new St John Ambulance Building on Wellington Street was laid by Lieutenant Governor Hon. Sir James Mitchell KCMC on 29 October 1939 who also later presided at the official opening on 10 June 1940. After the building was opened, it was made available for public viewing for a week to showcase the new facilities and promote its services to the community. As well as offices, meeting rooms and classrooms, the headquarters included living quarters for the ambulance drivers, a car repair shop and caretaker’s quarters. The planning of the whole building was arranged around a central circulation core which included a lift, whereby all levels of all parts of the building could be reached. An interesting detail about its construction is the choice of material for the façade. Ochiltree had originally designed the building using Donnybrook stone for the façade. However, financial constraints meant that instead concrete was used which was then textured to give the appearance of stone facing. Another curio of the building was the large boardroom table installed which had to be moved piece by piece into the boardroom via a window and then assembled in situ. Changes and additions were made over subsequent years. Originally there was a building to the west, but this was purchased by the organisation in 1947 and demolished to make way for a parking area and parade ground for the Brigade. Other improvements include the later separate single storey building to the north-east which was constructed in 1956. The purpose of the building was to provide sleeping quarters for the country drivers and accommodation for their ambulance vans while they were in Perth. In the early 1970s the Association conducted a review into its organisational structure and efficiency with a mind to its future growth and development. A recommendation to come out of this review was the need for a new administration building. When the new Belmont Administration Building was opened in 1979, the Association relocated all its administrative functions from Perth to Belmont. However, the building here in Wellington Street continued to be used as the headquarters for the Commandery and the Brigade as well as the central city depot for Ambulance Transport and for other activities of the Association such as a retail store, and a library and museum for the Association which was opened in 1995. By the early 2000s the Association had vacated all its functions and services from the Wellington Street building and were looking into options for its future use. In 2002/2003 planning was underway to repurpose and adapt the building into a youth hostel. A four storey extension was also made to the rear of the building to provide additional hostel accommodation. In March 2006, the new Perth City YHA was opened. Despite the changes and additions made to the site since it was constructed in 1940, including those made for the youth hostel, the exterior and interior of the original main building has remained much the same. 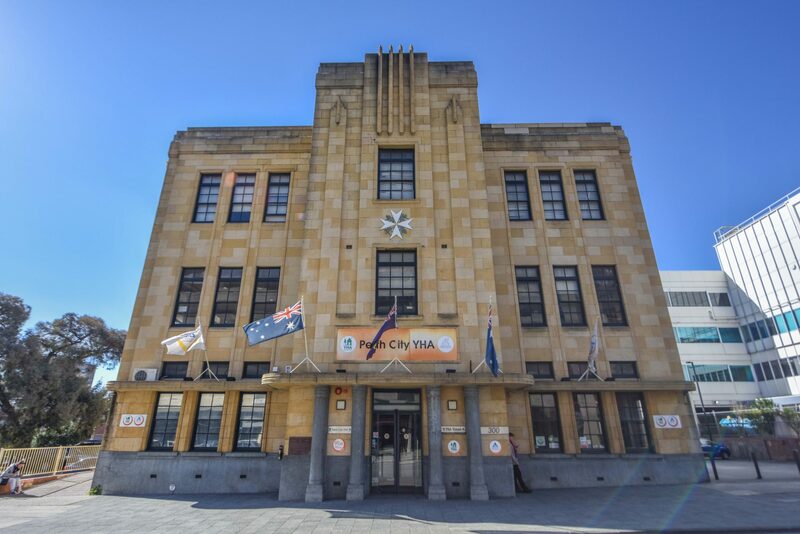 The façade also still features the insignia of the Association, although the raised lettering above the main entry forming the words ‘The St. John Ambulance Association’ has been covered over with a Perth City YHA sign. The interior of the building too still features many of its original decorative trims and the original lift is still functioning. Today, the St John’s Ambulance Building is still an important and rare example of a large, specialised building and as a definitive example of the Inter-War Art Deco style that is highly regarded by the Art Deco Society of Western Australia.